The SBMH-II semi-automatic blow molding machine is a multifunctional plastic blowing machine. Mainly used in the production of various types of PET mineral water bottles below 3L, beverage bottles, oil bottles, medicine bottles and other plastic packaging bottles. The blow molder is especially used in the production of high temperature filled PET bottles of 80-90 degrees Celsius. 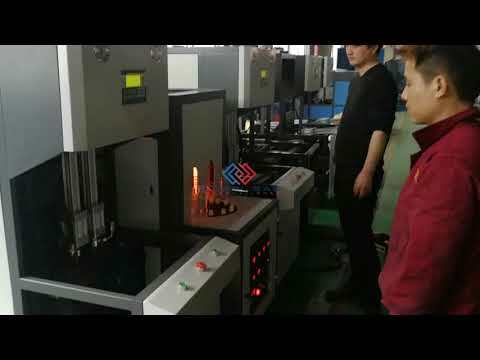 The two blow molding systems of the machine run simultaneously with an infrared oven, which doubles the production speed of ordinary semi-automatic blow molding equipment. It is a popular and efficient blow molding equipment. Microcomputer control system with an accuracy of 0.01 seconds. Only one person is required for production operation. Adjustment, replacement and maintenance are quick and easy. Fully adopt humanized design, use the latest control program, and adopt digital automatic control original in the electric control system to make the adjustment operation more convenient and applicable. The clamping mechanism adopts the double-bend composite hinge-combined with the buffer cylinder, which has large clamping force, stable operation, sensitive and reliable action, and completely eliminates the phenomenon of rising mode. Adopt a four-point synchronous mold adjustment mechanism to make the mold adjustment easy and precise. In the design and manufacturing process, the new concept of environmental protection and energy conservation is always implemented, and the high-efficiency silencer is used to evacuate the discarded silencer after work, which greatly reduces noise and improves the environmental sanitation of the production site. Adopt modular design and strong applicability. According to the processing property of plastics and the processing technology of the products, it can be equipped with aluminum oven, infrared oven, or corresponding pull-blow parts. This model is suitable for PET/PC/PP/PS/PMMA and another plastic polyester blowing. A variety of hollow products. This model adopts manual and automatic conversion circuit control for easy adjustment and production. The automatic control adopts a multi-point adjustment circuit, which can adjust the action time of clamping, stretching and blowing, and maximize the product forming effect and product qualification rate. Adopt the world first-class CAD/CAM/CAE technology to improve qualities and develop the new products. Have ISO9001 and CE international quality certification to assure our high-quality products. Over 20 years in blowing molding machine and tooling industry. Exported our products to Japan, Europe, South & North America, Southeast and Middle-east of Asia, over 100 countries and areas, annual income over 7 million US dollars for these machines. Machine is adopted the most advanced and market trend-leading technology, facilitating customer holding the most superior competitive position. Each mechanical movement has a safety self-locking device. When a certain process fails, the program will automatically switch to a safe state. The control system is the heart of the SBMH-II automatic bottle blower. High-tech human-computer interaction control panel, light touch screen (optional), accurate control, simple parameter setting, clear numerical display, ideal memory storage capability. The operation panel uses a large-size English man-machine interface touch screen, and all operations, parameter setting, monitoring, product counting, wall thickness control and other visual operations. The device fault self-judgment shows that the operation is simple. The imported PLC programmable controller has the process parameter storage and transfer function, the reaction is fast, the positioning is accurate, and the system has high stability during operation. The pneumatic dynamic system powers the operation of the SBMH-II. It uses world-renowned brand power components, like Festo in Germany, or Airtac in Taiwan to ensure high quality. These high-quality power components have specially-manufactured high-pressure valves, which have high motion accuracy, long service life, and stable performance. As the manufacturers of these famous brands of power components have outlets all over the world, customers can easily enjoy the after-sales service of related components locally. SBMH-II uses infrared heating mode. Its superior thermal radiation and thermal penetration capabilities allow the machine to reach the required temperature during high-speed operation. The infrared lamps are distributed in three heating zones, with independent voltage adjustment modules and computer control systems, which can provide ideal heating effects for different types of preforms. The horizontal position of each infrared lamp can be adjusted to increase the flexibility of the machine. The SBMH-II uses a four-mode clamping device. In addition, there is a specially designed high-pressure assisted clamping device that provides a strong clamping force. SBMH-II automatic blow molding machine specially designed preform conveying system. The flip manipulator loads the preform into the preform chain holder, heats it, and then the manipulator puts the heated preform onto the blowing system. After blowing, the bottle was demolded by a flipper.